Swimmers: Front Row Peter Fergus, Mike Jennings, Sunny Lowry, Arthur Ayres, Bill Bristow, John Unicume Wood (CSA Observer). Back Row. Arthur Endersby, Victor Birkett, Peter Frayne, Brian Finlay, Ken Fletcher, Bryan Finlay, Phil Rising, and Mrs Rising. Bryan Finlay in the back row. Great memories of our Coventry crew (Ayres, Endersby, Fergus and Finlay) attending this event to celebrate Peter Fergus’s crossing of the Channel (EF) on Friday 13th September 1960. Montserrat Tressaras gave-up her spot for Peter due to the horrible conditions on that day. Michael Jennings was Peter’s supporter in his boat with Captain Hutchinson. 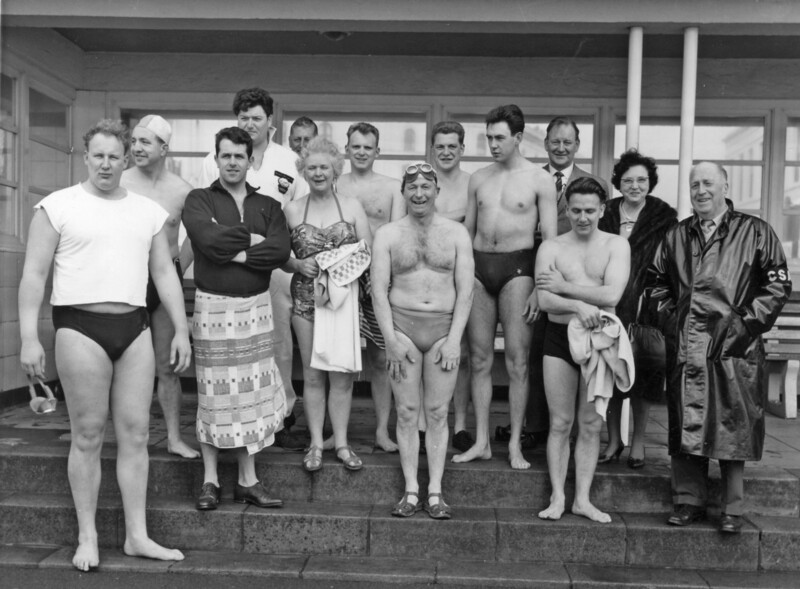 Mike Jennings and Norman Trusty..
Group of Channel swimmers at Dover - Sharp, Gollop, etc.